Taking the day off tomorrow. For the first time in my life, I'll be able to leave for work in the cold weather months and get into my daily driver without freezing my a$$ off. My DD will also stay pollen free in the Spring and will not bake in the Summer. It won't be subjected to heavy thunderstorm or hail. I moved my cars out of the way on Friday morning. Then the guys showed up to install the lift. Congratulations! The Lift looks great. It looks like you have room for a second lift and yet another car now. Thanks. The lift is very sturdy and surprisingly very quiet. It was a little chilly this morning. Temps in the 40s. Cold enough for a little frost on the windshield of outdoor cars. It was very nice to get into my car, open the garage, and back out into the weather from the inside of my warm seat. Thanks for suggesting Greg Smith Equipment. I didn't have much contact with them, but that's because everything went smoothly. Now I need to detail all the cars (including the underside) before it gets really cold. Greg Smith Automotive Equipment seems to be THE company for lifts. My credit card issuer is still wrestling with that other company to get them to refund the bogus charge. Live and learn. Already posted this in another general garage thread but it's appropriate here as well. This is the Harding steel lift. Apologies in advance for being BEFORE I get my Esprit but needed the lift and the timing was right. Interesting setup. What are the advantages to that over a more conventional 4-post lift? 4 post types won't work with the typical garage door I have (see pics). If I had two smallish cars, like the (to be purchased) Esprit and that Sunbeam, the door would go over both cars, however with taller sedans, I had to work it the way it's shown. Before anyone suggests it, a 4 post lift wouldn't go far enough 'back' into the garage to work, this style will. It is quite a bit more expensive than those types (except in my case I paid less than 50&#37; for my demo model....which included the floor tiles). The Harding steel lift is 10K retail. 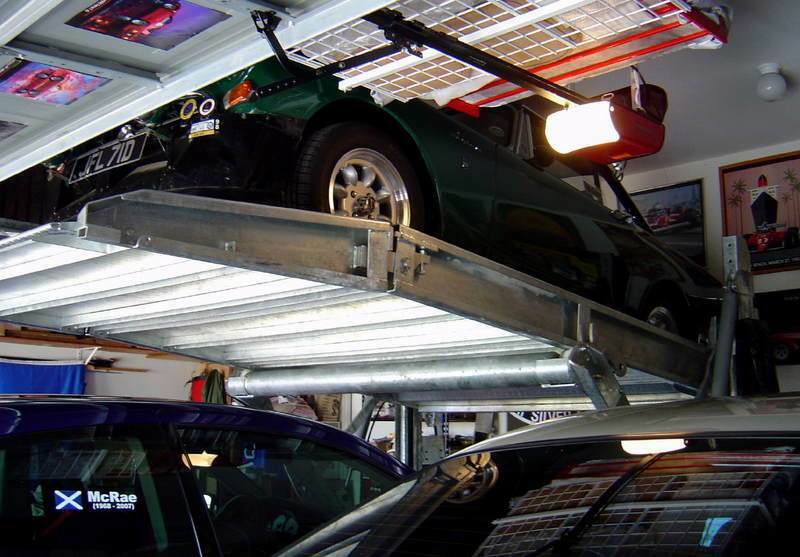 Oh, and this is a storage lift, not a maintenance lift, it has a complete coverage floor in it to protect cars under it. Works perfect for me as I didn't buy it for maintenance. 4 post types won't work with the typical garage door I have (see pics). If I had two smallish cars, like the (to be purchased) Esprit and that Sunbeam, the door would go over both cars, however with taller sedans, I had to work it the way it's shown. Before anyone suggests it, a 4 post lift wouldn't go far enough 'back' into the garage to work, this style will. It is quite a bit more expensive than those types (except in my case I paid less than 50% for my demo model....which included the floor tiles). The Harding steel lift is 10K retail. 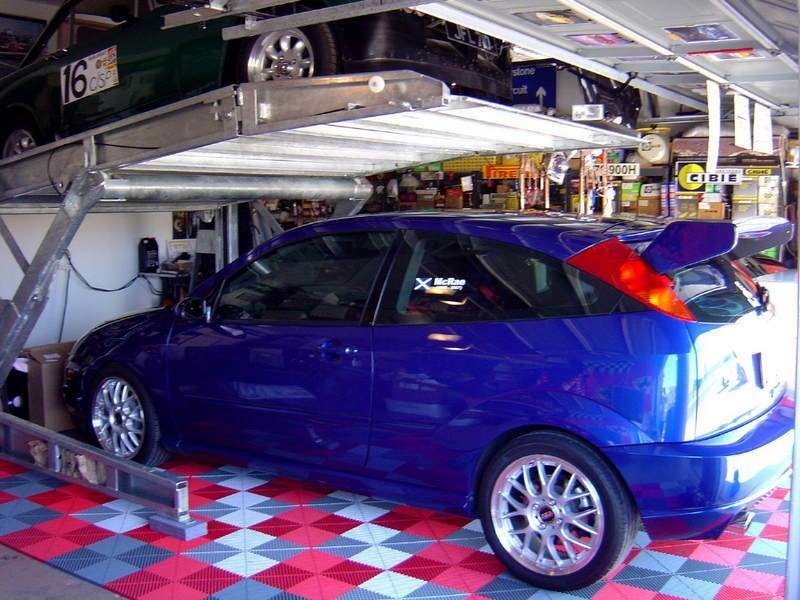 Oh, and this is a storage lift, not a maintenance lift, it has a complete coverage floor in it to protect cars under it. Works perfect for me as I didn't buy it for maintenance. I wasn't even aware that this type of lift was available. I had the same problem you did, and I had my garage door tracks raised and a jack-shaft opener installed. Neat to see that there are other options. I won't kid around about this being interesting to get right. In the first pic, it didn't work, clearly there is no room under the lift short of a 60's racing Lotus. I posted the pic as a clearer view of the lift with a car on it. We moved the lift back some more and turned the Alpine around, with the door programmed to stop one panel short (a bit over a foot) of fully open it works. As stated, there are compromises, my cars can be driven in and out however, anyone taller than my lofty 5'7" have to duck to clear it, but it still works. The reprogram of the opener is all that had to be modified. I have neighbors within a couple lots of my place that even walk past the garage with the doors open and had no idea there was a car above my Focus. Got a new toy today! No, it's not the E36M3 that's in dire need of TLC. 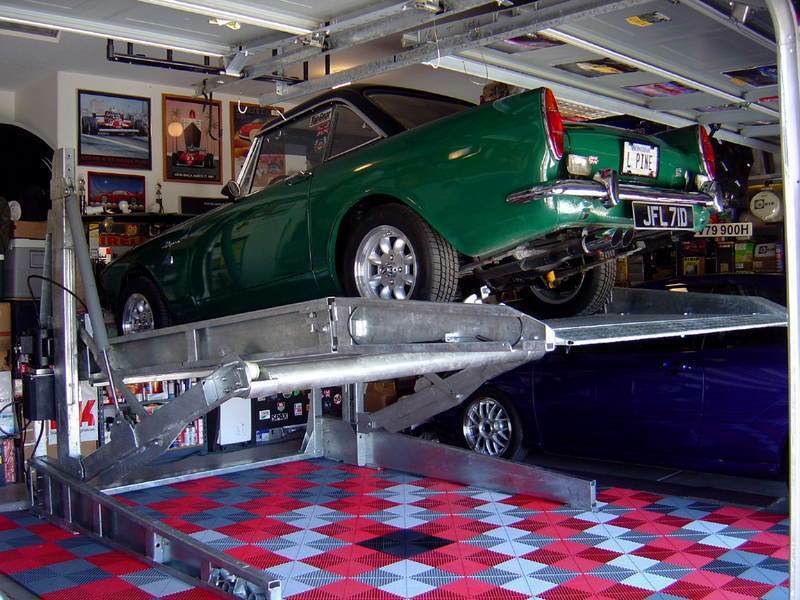 I went with an "outside slider" design lift from Automotive Lifts Hoists For Residential And Commercial Garages . It is the model called the "Titan-07 SUV" which is the higher lift and longer version with the wide space between the posts. If you have room for a larger version of whatever lift you are considering my opinion is that you should go larger. The space between the posts is pretty narrow even on wide lifts, and it would be a bummer to rip off a mirror or something on the narrower versions. If you need to get a narrow lift for space reasons make a large checklist of what to do (fold in mirrors, etc...) and post it so you don't have any misshaps. Also, on my lift I find it a litte difficult to see that all the locks are released since they are painted black, so putting a little dayglo orange fingernail polish on the view side of them helps me see when they are below the crossbar. If you are considering the outside collar / slider design such as the one I got or the Backyard Buddy I would have a third candidate to check out. The lifts from All American Lifts are IDENTICAL to the Backyard Buddy in design, the only difference that I can see in the product is that one is painted and one is powdercoated. The All American Lifts product will save you some money. If you contact them ask for Earl. Brad Davies at Automotive Lifts Hoists For Residential And Commercial Garages is really nice to deal with also (where I got my lift). My lift is not bolted down, and has not been problematic at all in that regard. Installing it yourself is pretty easy with a few people and a small engine hoist. Another thing to consider when trying to maximize your headroom for a lift is the placement of the opener. Raising the tracks for the door will give more headroom, but the typical placement of the opener will lower the headroom slightly where the opener motor is located. Replacing the opener with a jack shaft opener is one option. The other is to move your opener to a parallel track just outside the garage door opening. I did this for another reason on our other garage. Some idiot designed the garage with a big wood beam that was in the was of the opener when located in the normal location (I would be the idiot, hehe)... You can lift the door from the side by adding a z shaped piece of bent steel. This has lasted for 9 years so far with many uses per day and no failure of the door or opener. It may not be as durable for a door that does not have the reinforcing that is required for us here in the hurricane state. Anyone ever engineer some sort of side railing around the wheels in case of a strong earthquake? By the way, the side mounted roll up opener has worked great. Allows maximum height usage and is quite small. Here is an interesting opener, the I-Drive. Concentric opener, no loss of head room. I may try one of these in my new garage.